Our relaxing retreat combines yoga, walking and traditional crafts. Our intention is to provide a perfect balance between being active and relaxed. Daily yoga sessions run by our professional yoga teacher are created to quiet the mind and revive the body. Craft workshops provide an opportunity to do something different, learn a new skill and enjoy the result of one’s own handwork. Every day of your stay you will be able to choose to join one of the activities (revitalising walk in the nature, crafts workshops, visits to local places of interest), to rest soaking up the sunshine in the garden or chilling out with a book on the veranda. Your stay can be as active or as relaxing as you like. We stay in a 200 year old hamlet, owned and lovingly renovated by a local family. Our hosts prepare delicious meals with organic and locally sourced ingredients. As we are located in a region with a long wine tradition, some of the best quality wines will be available for the wine enthusiasts. 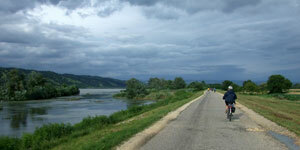 The Danube cycling trail is undoubtedly the most popular cycling route in Europe. It is a part of the EuroVelo Route 6 which connects the Atlantic Ocean with the Black Sea. Our tour follows its section through Serbia, from vineyards and steppes of Pannonian Plains, near the border with Croatia, to the Iron Gate Canyon in Djerdap National Park on the border with Romania. The Danube offers a large variety of landscapes. On our route, it runs through two National Parks and two Nature Reserves where the rich bio-diversity of flora and fauna is well preserved by natural heritage protection status. All along the river, cultural heritage is equally abundant. Some of the most beautiful Orthodox monasteries, Roman and medieval fortifications, prehistoric settlements are on our way. The tour explores mountainous regions in Eastern Serbia, its rich historical heritage and stunning scenery. This area is very sparsely populated by people and the rare villages stand as a nostalgic reminder of the traditional architecture and the way of life. The unspoiled nature cradles deep river gorges surrounded by limestone cliffs, thick forests and many caves. 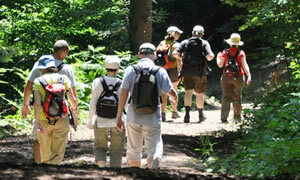 This is a superb environment of an exceptional natural beauty, ideal for hiking. This region is rich with historical and cultural heritage coming to life in still working medieval monasteries and in villages where woven rugs are still made by hand on looms. We will see some of the most important Serbian medieval monasteries situated in this area, as well as remains of the majestic Roman residence Mediana in Niš, the birthplace of Constantin the Great, the first Christian emperor of Rome.